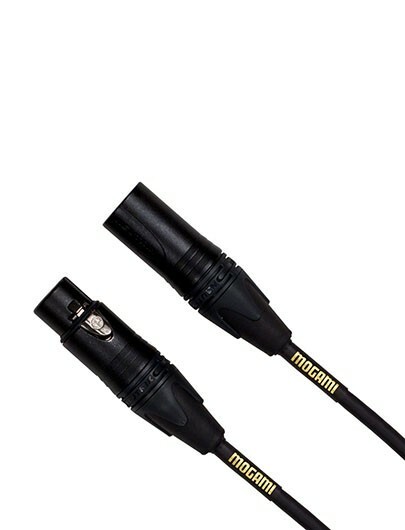 Mogami GOLD STUDIO-02 Microphone Cable, Gold 3-Pin XLR-F to XLR-M, 2 ft.
Mogami Gold Studio Microphone cables provide unequaled transparency, accuracy, an enhanced dynamic range, and the highest cancellation of noise. Ideal for nearly all applications from large recording studios to small project studios, Mogami Gold Studio Microphone cables are the quietest and best-sounding available. Assembled with Neutrik gold contact XLR male/female connectors and wired with Neglex 2534 Reference Standard Quad High Definition Microphone cable. Available in 2, 3, 6, 10, 15, 25, 50, 75, and 100 ft. lengths. Supported by Mogami's Lifetime "No Excuses" Warranty and Tommer Pro Audio, your Authorized Reseller. Are you the customer? Write a review! Mogami Gold Studio Microphone cables provide unequaled transparency, accuracy, an enhanced dynamic range, and the highest cancellation of noise. Ideal for nearly all applications from large recording studios to small project studios, Mogami Gold Studio Microphone cables are the quietest and best-sounding available. Assembled with Neutrik gold contact XLR male/female connectors and wired with Neglex 2534 Reference Standard Quad High Definition Microphone cable. Available in 2, 3, 6, 10, 15, 25, 50, 75, and 100 ft. lengths. Supported by Mogami's Lifetime "No Excuses" Warranty and Tommer Pro Audio, your Authorized Reseller.